Andy Reeher is president and CEO of Reeher LLC, which he started in 2002 as a shared management system to provide insights and frontline focus to improve management practices within university fundraising. He frequently writes and speaks on how development departments can fundraise more efficiently and effectively using data to find those donors who are most likely to give. Many nonprofits from colleges to boards and associations have dedicated groups of volunteers who help them meet their fundraising goals. What better way to increase engagement and reduce fundraising costs than to have volunteers solicit their peers with a personal appeal? Alumni groups, past president groups and foundation boards are all incorporating volunteer fundraising into their annual and campaign giving strategies. 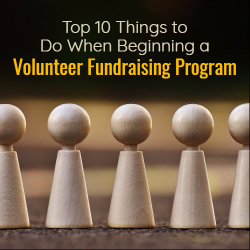 If you’re considering starting a volunteer fundraising program for your organization, here are ten things to do to get you started. Start Small. Establishing a culture of volunteer fundraising in your group can take time. The key is to start small and grow your program over time. As you recruit additional volunteers, they can help you find and recruit even more volunteers. Consider starting with a single class of alumni or segment of your foundation. From there you can expand your program to include all alumni or segments of your group. Decide How to Segment. Whether you want your volunteers to contact giving prospects from the same alumni area, current geographic region, profession or affinity, choose a method of segmentation and stick with it. It’s good to choose a method of segmentation where your volunteers are likely to have a lot in common with the people they are reaching out to. Recruit Volunteers. Many times those that already contribute to your organization are prime to extend their support as volunteers. Take a look at those with a strong affinity to your mission. Many successful programs are able to retain their volunteers year after year, so your recruiting should be less time-intensive once you build up your initial team of volunteers. Appoint Lead Volunteers. Enabling the success of your volunteers can be a challenge. You provide them with resources and training, but some volunteers still need on-on-one coaching to be successful. This is why lead volunteers are so important. They are able to provide more personal support directly to your volunteers, allowing you to focus on more strategic parts of the overall fundraising program. If you already have a program started, consider asking your highest performing volunteers to step into the role of lead volunteer. Assign Prospects. One of the most effective ways for assigning prospects to volunteers is to let them pick based on who they know best. You can create the list of who’s available to contact, exclude anyone with any special restrictions, and allow your volunteers to pick whom they’d like to contact. We typically see volunteers contacting between 10-25 prospects, but you can also leave it open for your volunteers to contact more prospects if they’re willing. Train Your Volunteers. It’s best to offer a variety of training options so that your volunteers can choose the one that best fits their learning style. In addition to the resources you have already created, you can offer in-person training or a campaign kick-off event, live online training, as well as recorded training for your volunteers. Focus Your Volunteer Efforts. Since your volunteers are busy people, focus their efforts around 2-3 key times or initiatives per year. Pick a 1-2 week period and ask them to contact 10 or more prospects during that period. Time this around a key event – maybe they get early access to register for your annual convention by taking part, or it’s a lead-in to homecoming or a special giving day. Analyze Results. One advantage of focusing your volunteer efforts over a few short 1-2 week periods throughout the year is it allows you time to analyze your results and make adjustments. Technology resources are available that can give you powerful analytics that allow you to easily identify your top performing volunteers, as well as those who are struggling. Recognize Your Volunteers. Your volunteers make a significant contribution with all of the time and effort they invest, so it’s important that they are recognized for their efforts. List their names in your annual donor report or ask them to stand up at an annual meeting or fundraising banquet. Another great way to recognize their contributions is to offer them special perks, maybe exclusive access to a popular event or important stakeholder. Recognizing your volunteers is a great way to promote a culture of enthusiastic volunteers who stay with your organization year after year. Volunteer fundraisers can be your key to success, but logistically can be challenging to manage. That’s why Reeher designed the first online and mobile tool to help organizations manage volunteers in your fundraising program. With Class Agent Fundraising, you can easily assign and manage volunteers, track their progress on tasks, provide the information they need to make the “asks” of their peers, and allow them to report progress and remain engaged with their team. You can view up-to-date campaign results at your fingertips – gone are the days of emailing spreadsheets and waiting for monthly reports to track your program’s progress. Visit Reeher’s website to try Class Agent Fundraising free for 14 days.